The second annual conference hosted by he Anomalous Experience Research Unit (AERU) at the Department of Sociology, University of York. More information to be announced - see www.forteantimes.com for updates. The first meeting of the Afterlife Research Centre (ARC) in the Department of Archaeology & Anthropology at the University of Bristol went really well yesterday. We had wide ranging discussions; from spiritualism and physical mediumship, through neo-platonism and creativity to Tibetan healing and the new religious movement Tenrikyo. All fascinating stuff. The first steps were also made in establishing a new peer-reviewed journal for presenting the research interests of members of the ARC, although this is still some way off. On the whole the workshop was very constructive and highly informative. I look forward immensely to the development of the ARC. (Left-Right, Yueh-po Huang, Fiona Bowie, Geoffrey Samuel, Angela Voss, Jack Hunter, Alexis Karkotis). "Why do statues weep? Did Nostradamus really predict 9/11? Is it true that we use 10% of our brain power? Does quantum theory explain the mystery of consciousness? For 21 years The Skeptic magazine, dedicated to truth through reason and evidence, has been answering these questions. The best have now been brought together in one myth-busting volume covering psychic fraudsters, psychic healing, alien abduction, near-death experiences, false memories and much more. Speakers include Wendy Grossman, founder and editor of The Skeptic, commentator and writer Simon Hoggart and Christine Mohr, one of the founders of Bristol Skeptics." You can read my "review" on the Reviews Page. "Neuroscientist and fiction writer, David Eagleman has, in his best-selling book Sum, written 40 tales from the afterlives. You may find that God is the size of a microbe and unaware of your existence. Perhaps the afterlife contains only those people whom you remember, or maybe God is a married couple struggling with discontent. In a different version, you work as a background character in other people’s dreams, or discover that the hereafter includes the thousands of previous gods who no longer attract followers. A series of wonderfully imagined tales – funny, wistful and unsettling – all rooted in science, romance and awe at our mysterious existence: a mixture of hope, love and death that cuts through human nature at innovative angles." My review can be read on the Reviews Page. The paranormal has always exerted a particular 'pull', triggering in some an urge to explore and explain and in others a more emotional or even spiritual reaction. Discussions about and enjoyment of a rich mixture of topics and experiences grouped under the umbrella term 'paranormal cultures' are becoming increasingly popular and mainstream. An abundance of media coverage, television and cinema entertainment and an ever growing interest in supernatural phenomena, ghosts, UFOs, psychic powers, astrology and other forms of alternative knowledges on the Internet testifies to a willingness to explore the 'paranormal' and the extraordinary in our everyday lives. This conference seeks to open up discussions about the anxieties, desires and engagements with the paranormal discourse, in popular culture, literature and visual culture as well as in everyday life, and across historical periods. The recent increase in popularity of all things paranormal across literature, art and popular culture suggests not only a reinvigorated interest in notions of the paranormal but possibly also new functions and pleasures of these fascinations, pursuits that scholars need to engage with, and we hope the conference will be a stimulating starting point for such engagements. Conversations across disciplines, from Anthropology, Cultural Studies, Media Studies, History, to Art History will be addressing questions such as: What is the influence of the paranormal on our personal and social lives? What can researching a society's engagements with the paranormal and alternative knowledges tell us about a culture? How should the recent increase in popularisation of the paranormal be interpreted? The Annual PA Convention is an multidisciplinary international gathering of scientists and scholars engaged in the study of psi or ('psychic') experiences, such as telepathy, clairvoyance, psychokinesis, psychic healing, and precognition. The convention features three days of papers and posters presenting the latest academic research taking place in laboratories and research centers around the world. PA conventions are open to the public, and provide ample opportunities for attendees to discuss and exchange ideas. L'Enclos Rey, a convent situated in the Parisian 15th sector, will be the site of the 2010 PA convention. Located just a short walk from the Eiffel Tower, the convent features a 6000 square metre garden within its walls, and can accommodate overnight guests at budget rates. With its urban location, there are many hotels, restaurants, and sight-seeing activities within walking distance of Enclos Rey. Preceding the convention will be a public-friendly day of lectures hosted by the Institut Métapsychique International. The IMI day will take place at the Enclos Rey on Thursday, July 22 from 09h00 to 19h00. This day, aimed at a general but sophisticated public, will touch on a number of themes, including the history of parapsychology, research, epistemological issues, and applications. A majority of the presentations will be in French. Registration details for the IMI day are available at http://www.metapsychique.org/IMI-Day-of-PA-Convention-2010.html. The IMI day will be followed by three days of PA convention activities in English. On Saturday evening, the annual banquet will be held at les Pavillons de Bercy, a cultural space and museum that holds three themed venues and outdoor gardens. The banquet speaker, Paul Devereux is managing editor and co-founder of the peer-reviewed publication, Time & Mind - The Journal of Archaeology, Consciousness and Culture. A research associate at the Royal College of Art and a Fellow of the Royal Society of Arts, Devereux was a Senior Research Fellow with the International Consciousness Research Laboratories (ICRL) in Princeton for twelve years. You are warmly invited to join us at the annual 14th Annual Conference of the Transpersonal Psychology Section of the British Psychological Society, 17th - 20th September 2010 at Cober Hill, Cloughton, near Scarborough. The conference is open to all who have an interest in the areas of spirituality, meditation, evolution of higher levels of consciousness, transpersonal psychotherapy, wholeness and wellbeing, aspects of paranormal experience and explorations of the possibility of post-mortem survival. The openness, warmth and friendliness of the conference has become its hallmark over the life and times of the Transpersonal Psychology Section. Meet old friends, make new connections and enjoy stimulating presentations and discussions in the peaceful and relaxing surroundings of Cober Hill conference centre. This years Keynote Speakers are: Dr. Peter Fenwick: 'The Significance of Deathbed Phenomena to the Dying and Their Carers'; Dr. lain McGilchrist: 'The Divided Brain and the Making of the Western World' and Professor David Fontana: 'Mysticism and the Transpersonal Vision'. 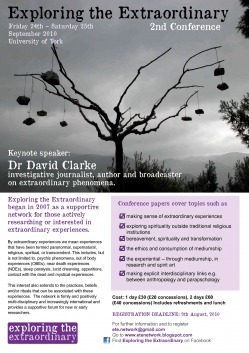 A booking form will be available on our website (http://www.transpersonalpsychology.org.uk/) soon.